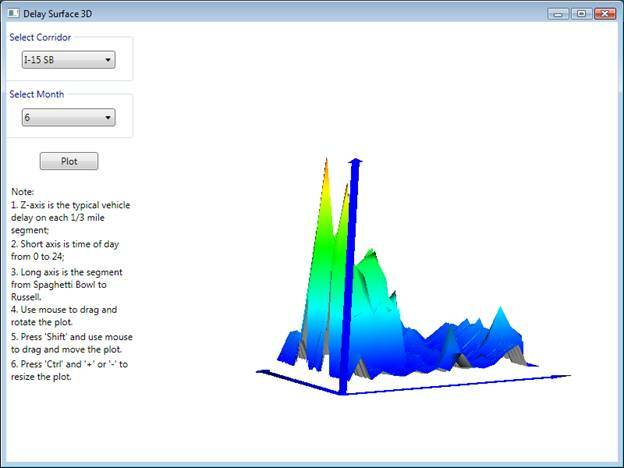 This interactive Vehicle Delay Surface 3D Plot is used to investigate typical vehicle delay on each 1/3 mile segment of a corridor from 0 to 24. By comparing the delay surface of different month, the freeway performance improvement can be easily observed. For example, I-15 Express Lanes were opened on 6/25/2010. By comparing the I-15 SB Delay Surface Plots of June and July, you may observe that more than 50% delay is mitigated since express lanes opened, and I-15 SB Sahara bottleneck is eliminated. 5. Press “Ctrl” and “+” or “-” to resize the plot. · The axis label and grid will be added in the next version.